The New Testament Greek word for witness and the word for martyr are the same, ‘martyroi’. Today in many places, as it was for the early church, to be a witness to Jesus Christ very often means death. But for most of us Christian witness is the the day-to-day experience of living our lives in ways that reveal’s the love of Jesus Christ. That does sometimes mean being unpopular, but thankfully does not mean giving of our lives. The particular and special role of political leaders, who like Maureen are disciple of Christ, is to show love by example – and to be the conscious of our fellow citizens. Our Mayor’s love for us and this town is shown through in her commitment to her Ward. She not only deals efficiently with her casework load, but is a generous person in other ways. 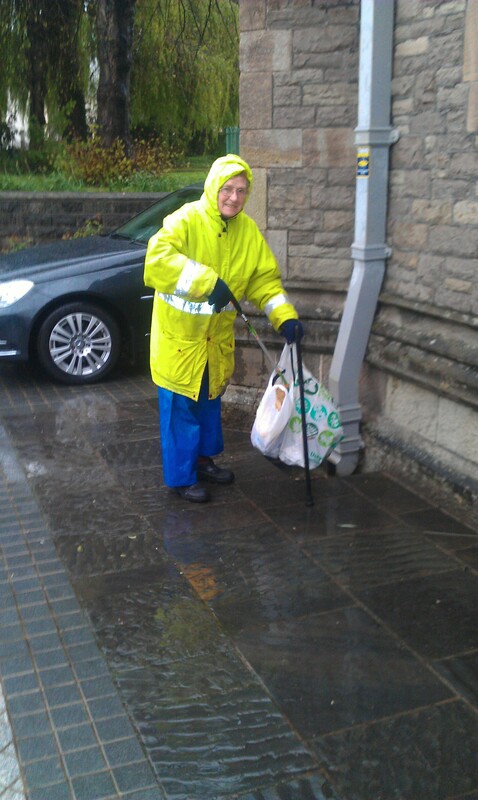 While most f the Citizens of Abergavenny are asleep on a Sunday morning she ( and her Consort John) will be up clearing the litter left over from the Saturday night partying. In his letter to the Phillipians St Paul says, ” If you have nay encouragement from being united with Christ, if any comfort from his love…then make my joy complete by being like minded” (2.1). He goes son to say, “Do nothing out of selfish ambition or vain conceit”, but take on “the very nature of a servant”. That is what Maureen has done as a local Councillor and what I pray God will enable her to do to during her year of office as Mayor – and not her only but all those of you who serve with her on Abergavenny Town Council. This year Bishop Richard has encouraged us to Walk with Mary as part of our Christian lives and witness. In our own diocese there are four priory churches dedicated to her and many others beside. She is central to our faith in that she bore and brought forth to the world our redeemer and saviour, the word that was made flesh. On the 1st July Bishop Richard will be joining us in Abergavenny for the last of six of his evening events reflecting on who Mary is and her importance to her not only as Anglicans but as Christians and our discipleship. Rev’d Philp Godsell will share with us his own unique Walk with Mary shortly after his being ordained priest. Please join Bishop Richard and other friends from across our diocese as we seek to celebrate our common life together and prepare for our diocesan pilgrimage to take place at the end of August to the Shrine of our Lady of Walsingham. It is customary for a newly Ordained Priest to offer a Mass of Thanksgiving to the Blessed Virgin Mary. Fr Phil Godsell who was an Ordinand of this Parish, will offer his Mass for the BVM at 6.30pm on Tuesday, June 30th.